Once again I’m committing to doing 30 paintings in 30 days — all from life. Dottie Leatherwood was a huge inspiration for my decision. I always learn a tremendous amount when I paint daily, but this time it feels more meaningful. I saw Dottie’s post about donating 50% to Hurricane Harvey victims and realized what a wonderful idea! So for every painting that sells, 50% will be donated to victims of Hurricane Harvey. They will be posted on Daily Paintworks, or you may contact me directly. If you purchase one, please let me know your preference for donation – Red Cross or Houston Humane Society. If you have a favorite charity that you’re familiar with that benefits those affected by this horrific event, please let me know. I received an email from the Portrait Society today. They have set up a drive to donate art supplies to the hundreds of children who are stranded in shelters. Many people had to leave their homes with little more than the clothes on their backs. So they are coordinating a drive to send coloring books, art pads, colored pencils and markers to these children in the Dallas and Houston convention centers. So that is another cause that I would be happy to send donations to as well. All 30 paintings will be from life — so either plein air, interiors, people or still life. My other caveat that I’m adding for my own education, is to do every painting with a limited palette. For instance, the painting above “Bringing you Flowers” was done with White, Ultramarine Blue, Permanent Rose and Cadmium Yellow Light. I’m excited about the opportunity to learn more — and to help some in this horrible situation in Texas. Having experienced many hurricanes myself, I know how your life comes to a complete standstill — but I’ve never experienced any as intense and destructive as Harvey. My heart goes out to all those folks! To purchase this painting http://www.dailypaintworks.com/fineart/robin-wellner/bringing-you-flowers/620548. 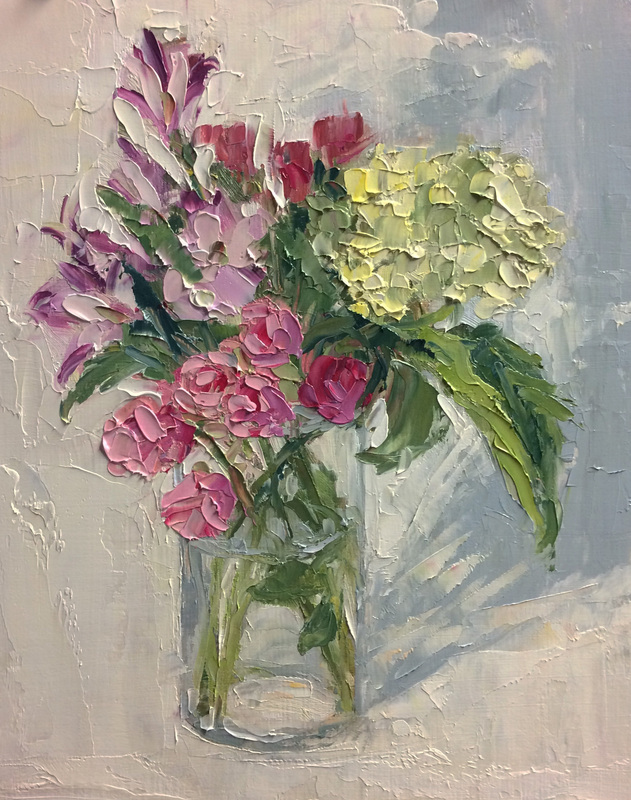 This entry was posted in 30 in 30 Daily Paintings, Palette Knife Painting, Strada Easel Challenge and tagged 30 in 30, Donatetohelp, Floral painting, palette knife painting, Still Life, strada easel on September 1, 2017 by Robin Wellner.